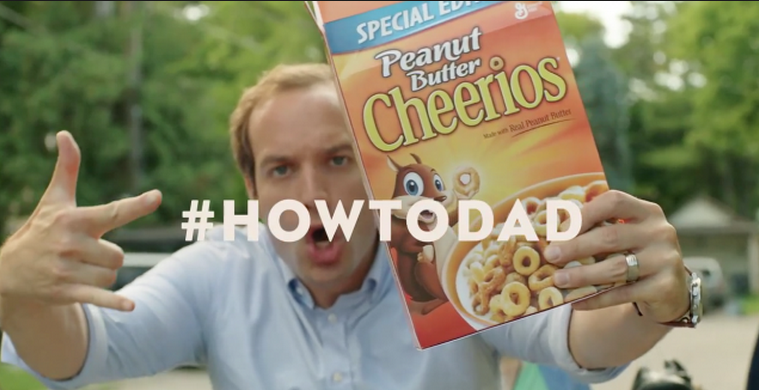 In a new commercial for Peanut Butter Cheerios by Tribal Worldwide in Toronto, a fast-talking, do-it-all father shows us exactly “how to dad.” He builds forts, tells hilarious jokes, plays dress up, and of course, serves his kids Peanut Butter Cheerios. Nice work, actor dad. I guess that Simpleton fathers like Homer Simpson and Hank Hill are on the way out. Heck, for that matter, step aside, moms. Take-charge dads who still remember what it means to be cool are on the way in. At least that’s the message of General Mills’ fresh Canadian ad campaign for the tasty (and sickly sweet) new Peanut Butter Cheerios cereal. The ads position Peanut Butter Cheerios as a responsible – but still totally cool – breakfast option for the whole family. As the father in the spot tells us, “being a dad is awesome, just like new Peanut Butter Cheerios are awesome.” One would hope that Peanut Butter Cheerios don’t come with newfound responsibilities like changing diapers, but I think I get the idea. Kids love sweet-flavored cereals regardless, and General Mills knows it’s the parents who need convincing. But every parent dreams of perfectly walking that line of being responsible, yet still hip, and Peanut Butter Cheerios promise to help them do just that. Yeah, right. Of course, I am having none of this peanut butter business in my morning bowl. A heaping bowl of moistened sugar is not exactly what society’s already-overactive children need to start the day. Cheerios’ view of fatherhood in 2014 is a bit more progressive and reliable than the traditional media depiction. At least it still includes the lazy, unhealthy meals provided by dads of yesteryear. Well written…Hilarious and witty…Love your style of writing, will surely check your other work soon! Good day..